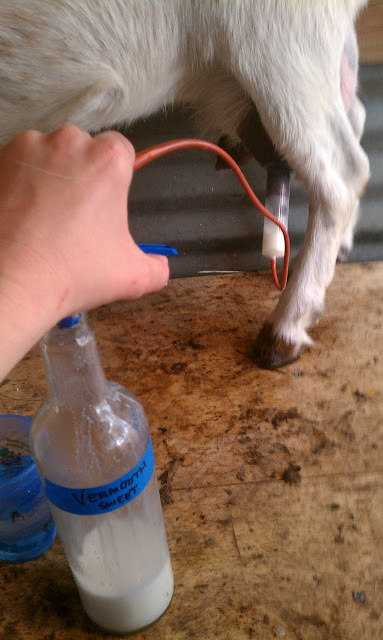 After a few ham fisted attempts on our part and a lot of stomping of feet on their's, we finally got the new goat gals milked. It's an odd thing to get used to. You want to pull on the teat, but what you really need to do is pinch off the milk filled teat from the rest of the udder then squeeze out the contents. It takes practice to get right. Big Onion was very quick to build us a milking stand which helped a lot. It's just a syringe attached to an old cath tube that is attached to a spray bottle nozzle. 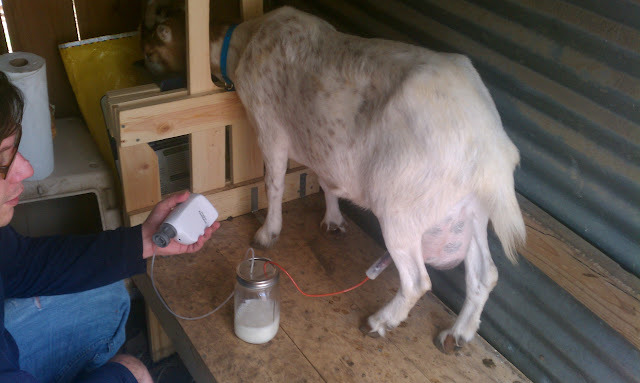 It worked ok as long as the system stayed full of liquid, but if the milk ran out, it lost suction. Plus all that pumping of the trigger was harder on the hands than teat squeezin. I got the idea for my next contraption from this video. This has been working pretty great for us. The next thing I need to do is upgrade the jar to something larger since we tend to get a little over a quart per milking. The other thing we have been working on is making friends with our goats. Before we got them, I don't thing they had been handled very much. They had never been milked. At first we had to basically catch them and carry/drag them onto the milking stand. Once they got settled in and eating, we took up their food and only allowed them grain when being milked. They do get free access to alfalfa hay all day. We also discovered that Josie loves grapes and Jenni is crazy for oats. It's taken a week or two, but now both girls are jumping onto the milking stand with very little encouragement on our part and eating their way thru most of the milking process. Josie will even let you scratch her neck and under her horns as long as you move slowly. Right now they are living in a smallish pen that is sectioned off in the back yard. Until they are happily jumping up and into the stand all on their own, I'm not going to let them out of that pen. I'm NOT having a repeat of the Benny Hill incident of the first night. I'm looking forward to the day when we can let them loose in the fields to graze to their heart's content. My Honda Element is the transport vehicle of choice here as well. It is a good car for making do. I went to buy some lumber to fix up some of our more damaged pens, and I couldn't believe I fit a 10 foot piece of 2x4 in there. And K must have transported half a ton of scrap metal from the creek bank in there, too. Not sure what we'd do without that thing. You ever use it for towing? I'm wondering if it'd be able to handle a small stock trailer.